TÖRRING-JETTENBACH, Joseph Ignaz Felix and Edmund EGG. 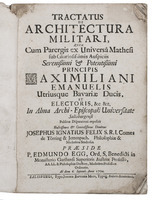 Salzburg, Joannis Baptistae Mayr, 1700. Large 4yo (30 x 22 cm) With an engraved frontispiece, 17 engraved plates and 1 letterpress folding table. 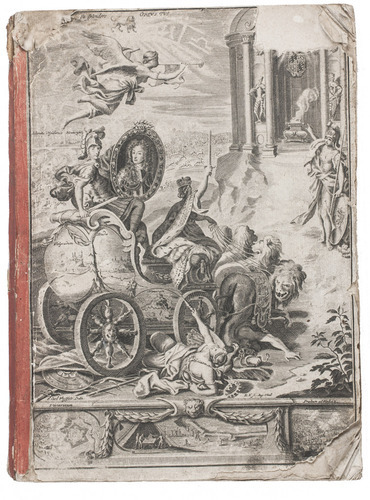 Spine reinforced with orange paper, with the frontispiece serving as provisional front wrapper and last leaf as back wrapper. 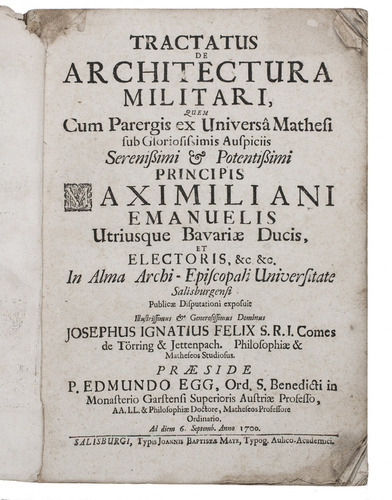 First and only edition, in the original Latin, of the dissertation on military architecture by the German mathematics and philosophy student Joseph Ignaz Felix Törring-Jettenbach (1682-1763), under supervision of the professor of mathematics Edmund Egg (1665-1717). 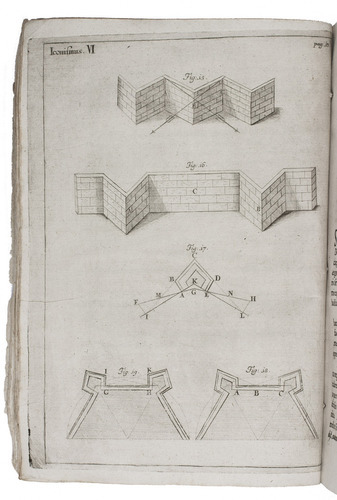 It first explains the different terms (in both Latin and German) and different methods of fortifications. 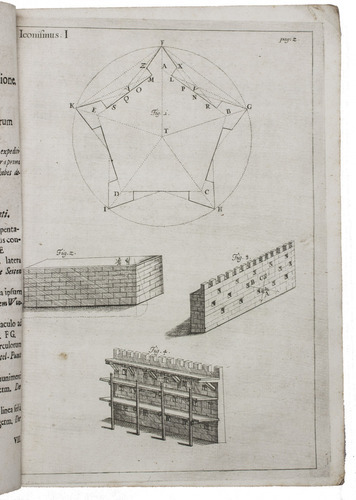 The main part of the text is devoted to explaining and solving different "problems" and "cases", which are clarified in the engraved plates. "Eine ungewöhnlich umfangreiche und überraschend reich, auch mit Plänen ausgestattete Dissertation der Salzburger Universität" (Jähns). Fronstispiece heavily damaged, upper and lower outer corner worn off, as well as a smaller piece of the upper left corner. 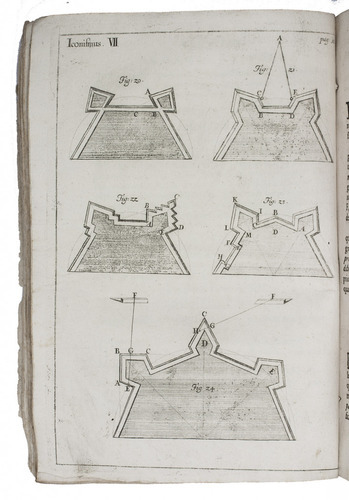 Nevertheless, the main illustration is still intact. First couple leaves frayed at the outer corners and slightly browned. Otherwise in good condition, with some occasional small spots. Jähns, pp. 1396-1397; Jordan 3790.